Out of print, but this is a prime candidate for reissuing by a new publisher. The many associations with concepts of nature and science are justification enough, but the real reason is superior quality of every aspect of this book- well-paced story, lyrical language, lively characterization, subtle but detailed illustrations, and a satisfying ending that works on every level. Find it somewhere and share it. Lovely illustrations that would equally honor a natural history book. The story is cute, too, but it;s the illustrations that really stand out. I love the pictures in this book. It's really about a relationship between a mouse and it's house which happens to be a Jack-O-Lantern. This was one of the books that was at my grandparents house growing up. It's funny to me that I remember which books stayed there and which ones we had at home. Anyway, the story is beyond mundane but the pictures are so sweet that I can't bear to part with it. This book is older but I think it is still a valuable read for a classroom. It has short easy sentences, but it larger (like a miniature chapter book) and beautiful illustrations. The story is fiction, but there are a lot of nonfiction items that could be used for learning. Decay, food chains, seasons, and hibernation are all contained in this short story. A very cute book with decent illustrations (the images are more in line with what an adult would appreciate, not a child - there's actually a psychology behind the different styles of children's illustrations, did you know that?). I still love this book, though. This book is out of print, and I'd like to find a used copy somewhere to keep. Beautiful pictures and a great story about how an abandoned jack o'lantern left out in the snow becomes a warm winter home for Mousekin. This is such a sweet and heart warming book. The illustrations are classic and the book teaches children all about the creatures and critters in the forest! When I read this book, I had a comforting smile across my face. It was sweet, simple and perfect! The copy we took out of the library has an ugly cover that doesn't do the illustrations inside justice. The story is simple: A mouse uses a discarded jack'o'lantern as a hiding place and then home. The illustrations are beautiful. The details show the animals very realistically. Love this book! Really hope it gets reprinted. Edna Miller books are the best. Since reading this book years ago I never carve a pumpkin without picturing how it might collapse and rot. Mice are cutist outside camping in pumpkins. Mousekin finds a new house to keep him warm in the winter. Very cute book for after Halloween. One of my favorite books growing up! Edna Miller - Born in 1920 and grew up in NYC. Later lived in Vermont and Maryland. "As a child I developed a great love of animals. At the zoo in Central Park, I made childish sketches of my favorite animals. 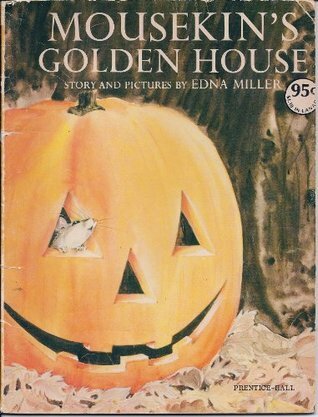 The Museum of Natural History was my second home.The idea for my first book, Mousekin's Golden House, came to me shortly after Halloween when I had put the family pumpkin outside. One evening I noticed a small, white-footed mouse exploring the jack-o'-lantern for the few seeds it contained. I thought what a fine house it would make for a white-footed mouse who forever discards one home and searches for another. ""Edna Miller grew up in New York City near The American Museum of Natural History where the animal exhibits always interested her. During her travels in this country and abroad, Mrs. Miller has observed the behavior and habits of animal life. After completing Mousekin's Christmas Eve, Mrs. Miller felt there was only one reward she could give the live mouse she was using as her model. He had been well fed and exercised, but a wire cage was no place for a healthy mouse. She 'carried the cage to the woods and opened the door-- to freedom.'" --from the dustjacket of Mousekins's Christmas Eve.